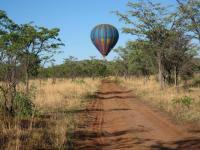 The impressive Soutpansberg lies about 130 kilometers from east to west and the highest peak is Letsumbe at 1747 meters. This mountain-salt pan mountain- got its name from a salt pan which has been the source of the salt for this region for centuries. The road to the North weaves its way through the mountain range whilst treating the tourist with ever changing views of the mountains, woods and far away planes. The Limpopo River flows through this natural basin, giving life to more than 500 species, a series of farming villages and a high concentration of leopards. Large Baobab trees, spread over the warm, dry lowveld landscape, are the rulers of this bushveld region.